Using the Field Settings specification, you can delete, reorder, and edit the appearance of fields you have selected for your application. To delete a field from your application, check the box referring the field you want to delete and click accept. Notice that in the screenshot the Customer Number field cannot be deleted. This is because the field is a sequence key. 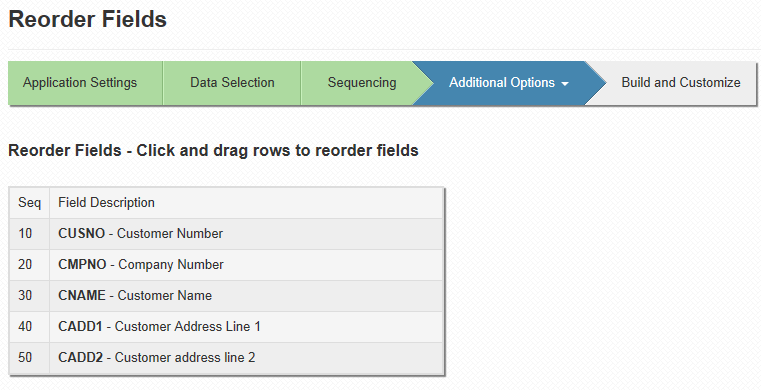 Any field that is linked to a sequence, external object, calculation, SmartLink, or record selection cannot be deleted. Hovering over the delete icon will provide information detailing where the field is linked. You must remove these dependencies before the field can be deleted. Initially, fields will be listed in the order they were added. To re-order fields, click "Re-Order". You will be brought to the following screen. Click and drag a field to re-order it. Field order is listed from top-to-bottom. The field at the top will appear first in the finished application, and the field at the bottom will appear last. While you cannot use Field Settings to change values or fields in the database, you can change their appearances in the application. Therefore, note that editing in field settings is not global, rather only application specific. Field Description- This appears in the final application, and inherits its value from its global definition at the dictionary level. 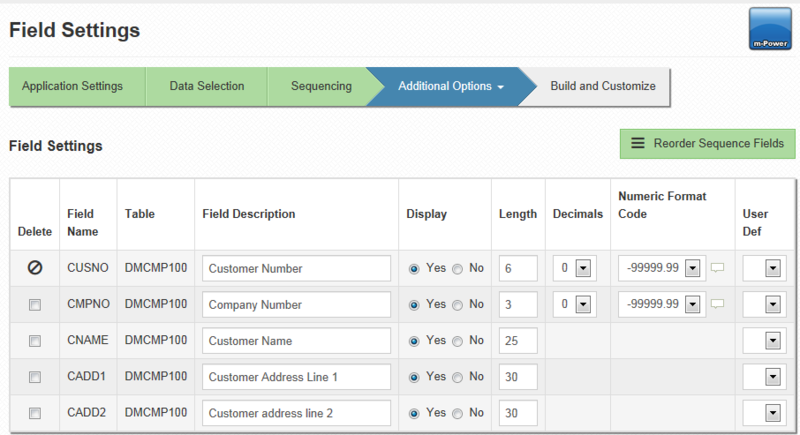 Set an appropriate description so that the end-users can understand the field. Display- Set "Yes" if you want the field to appear in the application. Setting "No" will allow your application to use the field as necessary (such as in calculations), but not display the field to the end-user. Length- Set the length of the field. The length includes the decimal places, such that 25.325 has a length of 5. Decimals- Set the desired amount of decimal places. A blank in this column indicated your field is character based. Number Format Code- Select the format used to display your data. For information on creating your own date or time format, click here.